Recently in the forums, the Snipers and Scoundrels had their Q&A. In my opinion, the questions were pretty good and well thought out; the answers were as well. Granted, some were not the most in depth answers imaginable but, what can you do? Following is the full Q&A posted in the SWTOR forums. Give it a read for it's definitely worth it. I will be posting my opinion on these soon, as well as some suggestions for the Operative Q&A in order to prevent us from asking similar questions or asking questions that may yield similar answers. Yes, there is a difference! Anyways, read on my fellow Agents. Read on. With 4v4 arenas on the horizon, one concern about the value of the sniper class is its lack of any significant offensive cooldown(s) compared to some of the other ACs. Snipers are capable of some of the highest and most consistent DPS in the game, but are also quite predictable because of cast abilities requiring static line of sight and lack of any dynamic burst that comes along with a valuable offensive cooldown. While useful in their own right, Target Acquired and Laze Target don’t have the same on-demand impact that one comes to expect from an offensive cooldown. Are there any plans to address either one of these abilities, considering their slightly underwhelming impact in PvP? Target Acquired, while admittedly “boring” in what it does, is a rather powerful cooldown in PvP. It’s great for cutting through a tank or heavily armored opponent’s defenses, or simply improving your already great damage. On the other hand, Laze Target does leave a bit to be desired. As you stated in the question, Snipers already deal some of the highest, most consistent damage in the game, so any change to Laze Target would likely come at a price. For example, we could consider changing Laze Target to increase the critical hit chance of your next Ambush, Explosive Probe, or Takedown by 100% (instead of Snipe) – but would you really want that change if it meant that another minute or two were added to Laze Target’s cooldown? A specific 5/18/23 hybrid spec appears to be quite popular at current due to higher dps. In your play tests, do you have any numbers that support this theory in comparison to numbers for full lethality snipers? Is Lethality in a good place right now in relation to the Hybrid and what, if any concerns, do you have about balance? Lethality appears to be better single target DPS than the hybrid. However, since a lot of encounters have two or more mobs, the hybrid spec would likely appear to come out ahead of a full Lethality build quite often. That said, we are not completely satisfied with Lethality at the moment. We specifically don’t like that using Orbital Strike and Explosive Probe rotationally as a Lethality Sniper increases your single target damage, but that’s more of a problem with Orbital Strike and Explosive Probe than Lethality. Weakening Blast could probably use an energy cost and, as a result, get a damage boost. Series of Shots and Snipe could probably use some boons to make them stronger abilities in the Lethality rotation – as it stands, they are in the rotation, but not strong enough to keep players from using Explosive Probe and Orbital Strike. While all of this is less than ideal, making changes to Explosive Probe and Orbital Strike could have negative effects on the other Sniper specializations, so it isn’t likely that you will see changes for this anytime soon. But we will certainly be addressing these issues at some point in the future. Engineering snipers currently use a strategy of rolling Scatter Bombs to target a large or predictable boss. However, this strategy becomes unworkable when encountering less predictable opponents like Kephess the Undying or multi-target fights like Cartel Warlords and Dread Master Styrak. Engineers tend to fall behind Marksman and Lethality snipers in situations when they are unable to set up Scatter Bombs. In addition to Scatter Bombs, Plasma Probe’s effectiveness suffers in high movement or quick target swapping fights. This is due to the issue that Plasma Probe has no way of continuing damage to targets who have already left its radius. What are your views on this perception of the Engineering sniper? How would you assess the Engineering sniper’s PvE performance – both strengths and weaknesses – in relation to Marksman and Lethality, and what might be done to address those weaknesses? We don’t intend for Scatter Bombs to be rotational in any way, shape, or form (for PvE or PvP usage). Scatter Bombs are meant to be a fun bit of extra damage that occurs when you roll into or away from the action. That said, we’re okay with you trapping an unsuspecting enemy for a “wall bang” every now and then. After all, they can avoid this with careful positioning (just as you must be careful about your own positioning to set it up). We are not completely satisfied with how Engineering currently plays in general. When compared to Lethality or Marksmanship, Engineering feels rather clunky. The strength of Engineering in PvE is definitely AoE damage, while the weaknesses are mostly quality of life issues like energy management, Interrogation Probe’s single target limit, Plasma Probe’s cooldown, and lack of a well-flowing rotation – thanks to the extremely long cooldowns on Explosive Probe and Orbital Strike, along with the unfriendly requirement of using EMP Discharge with Adrenaline Probe to maximize sustained damage. For all areas of play, there seems to be a huge reliance on Shoot First for Scrapper, moreso than Dirty Fighting. However, there are few ways to reliably go into stealth and no proc that allows its use out of stealth (even without the knockdown). In PvP encounters, Shoot First can often be the difference between winning and losing a fight, and because of this, Scrapper still plays like a 'lone wolf' class, contributing much less in prolonged fights out of stealth compared to quick in-and-out battles where Shoot First can be used effectively. Many PvE encounters start with AOE attacks or have advanced stealth detection, making it nearly impossible to start with Shoot First. Scrapper also suffers from rotation concerns. While the energy return with Turn the Tables was a great addition, it can sometimes trigger at or near full energy, effectively wasting the return. The sustained damage rotation can also feel clunky at times due to the lack of suitable filler attacks; Quick Shot seems like it is intended to fulfill this role, given that there are talents within each dps tree that boost its damage. However, many feel that it fails to do so. Due to its energy cost, short range, and small damage increase over Flurry Bolts, many Scrappers generally prefer to use Flurry of Bolts when nothing else is available. The above two issues can cause problems with energy management: an energy return mechanic that is unreliable and using our basic attack as a rotational filler rather than simply as a way to conserve energy. How do the players's perceptions of Scrapper's role in PvP as a lone wolf class, the extra difficulties it faces in PvE encounters, the confusion surrounding rotation mechanics, and your own metrics of class performance match up with the combat team's expectations for Scrappers? Can you shed some light on any current internal discussions that are aimed at alleviating these issues? Many a stealth class or specialization has struggled with the feeling of being a “Lone Wolf” in PvP in many different games over the past decade (and maybe even longer). We do not believe this has ever necessarily been each and every designer’s intention for stealth classes, but rather, a byproduct of the stealth ability itself – often times, a stealther is able to go places where his allies can only dream of going. While designers may be able to take some steps here and there to give players some tools which reduce that “Lone Wolf” feeling (see the answer to Question 2 for more on this), the greatest power for eliminating this feeling actually lies with the stealther and the stealther’s allies. There may be more we can do to alleviate these concerns, so please feel free to point us at specific skills or abilities that you feel take away from your ability to play as part of a team. We will not be removing stealth itself, but we are open to making stealthers as “team friendly” as possible (within reason, of course). Shoot First/Hidden Strike does great damage because it requires you to be stealthed behind your target. If it did not require stealth, it would do considerably less damage. Our metrics assume that Shoot First/Hidden Strike is only used once per encounter, so if you are using Disappearing Act/Cloaking Screen to perform additional Shoot First/Hidden Strike attacks in a single encounter, then you are probably performing above our expectations. We understand the difficulties in using a positional attack from stealth, and we do not wish to require players to use an escape mechanic to produce competitive, sustained damage. That said, we have to be careful to keep the burst damage at a reasonable level when the mechanic is used. 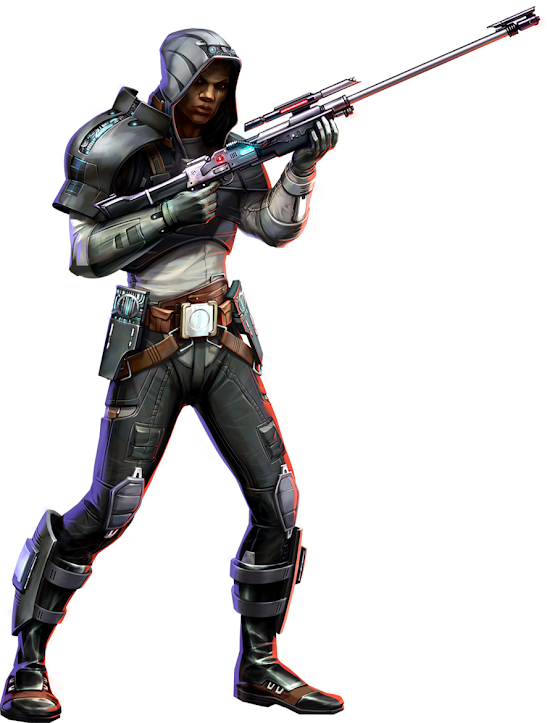 We might consider giving Scrapper/Concealment Scoundrels/Operatives a way to use Shoot First/Hidden Strike outside of stealth, since they already have many skills that improve it, but such a drastic change to gameplay would be more likely to come along in an expansion pack than a balance update. Rotationally speaking, we could have Turn the Tables/Culling return your energy over time rather than immediately, though we are not sure all Scoundrels/Operatives would be happy with that change (especially when you are not anywhere close to full energy). That would resolve the issue with it triggering at or near full energy, but is it something that Scoundrels/Operatives would actually want? Quick Shot/Overload Shot is admittedly a poor filler ability. A scoring check reveals that, for its energy cost, it should deal more damage than it does, and we can fix that in a patch by properly rebalancing the ability. Hopefully, rebalancing Quick Shot/Overload Shot will make it into the competent filler attack that it was meant to be. With the most recent round of questions, it was revealed that Advanced Classes who can heal have their basic heals included within their survivability profiles for damage specs. There are many concerns with how this applies to Scoundrels in that, although we do have some 30m abilities, we are primarily a melee damage class, unlike the other two healing classes. Therefore, we cannot easily line of sight an enemy to heal, and these heals are also very costly in both energy and Upper Hand. Although Scamper is a great new skill that can create some space, it similarly comes with a high energy cost, and it does not create enough space in most scenarios (not that it should). Disappearing Act also seems to be a good escape tool, but it double purposes as an offensive cooldown and additionally nullifies all incoming healing without the Fight or Flight talent. Scoundrels lack some PvP defensive talents that are common in other classes, such as ones that trigger while being stunned or talents that provide AOE damage reduction. Scrapper also lost a bit of its passive survivability in 2.0 with the change to Pugnacity. Surprise Comeback originally healed a constant, moderate amount over time; it now only ticks 4 times, for a total of 16% of max health every two minutes. Can the devs explain the design philosophy for Scoundrel survivability and how it is different compared to other classes and offer some insight into future changes that will address these issues? Scoundrels/Operatives are meant to be shady, slippery characters that survive by escaping rather than sticking around to face the brunt of a foe’s attack. For Scoundrels/Operatives, both their ability to heal and their ability to stealth count toward their ability to survive. We do not give every single class an area-of-effect damage reduction skill because we want there to be differences and play-style variances among the classes. That is also why not every class can wear heavy armor, enter stealth mode, or heal. That is not to say that Scoundrels/Operatives will never gain access to such a skill, but they also should not expect a skill like that any time soon. As for upcoming survivability changes, we are planning to make a change to Disappearing Act/Cloaking Screen (and also to Force Cloak, for any Jedi Shadows or Sith Assassins that may be reading this) so that it no longer decreases all healing received by 100%. It will still decrease all healing done by 100%, so Scoundrel/Operative healers will not be able to continue healing themselves or their allies with their heal-over-time abilities from the hidden safety of stealth mode. But this change will allow Scoundrels/Operatives to be healed by other allies immediately after using Disappearing Act/Cloaking Screen, which should help to address both Scoundrel/Operative survivability in group situations and, to some extent, the “Lone Wolf” issue you mentioned in the first question. We are concerned that Sawbones/Medicine survivability is probably a little bit too good, which means any survivability we give to Scoundrels/Operatives cannot be made available to the Sawbones/Medicine specialization. To address this, we may consider moving some Sawbones/Medicine survivability skills over to the Scrapper/Concealment and Dirty Fighting/Lethality specializations (as part of a skill trade), but we do not currently have any details to share about what these exact changes may be. Many players find the current set bonuses lacking for many specs, in both PvE and PvP. The current 4pc set bonus, +5 max energy is somewhat of an enigma to many players. Firstly, it only adds +5% energy--so 2 energy at max-tier regen, 2 and mid, and 1 for low (meaning it is less valuable than the similar "Bravado" talent for Gunslingers). Secondly, many players are confused as to what it adds to the Scoundrel rotation. In practice, the additional energy really isn't noticeable. In PvP, the 2pc bonuses for each role seem to be lacking. The increase to Kolto Cloud was moved to the PvE set and was replaced with a boost to Defense Screen, which doesn't seem like a fair tradeoff since many Sawbones in PvP don't feel that they have survivability issues (quite the opposite). The DPS set bonus is equally underused. In fact, many DPS Scoundrels, in PvP and PvE, prefer to use the Gunslinger 2pc PvP bonus over other Scoundrel bonuses. Many players have shown that the extra tick for XS Freighter Flyby adds the highest DPS gain, even on a single-target encounter and even in PvE situations, factoring in the loss of mainstat. Can you explain the intent behind the 4pc bonuses and comment on the way that players are currently stacking their set bonuses (e.g. picking up the Gunslinger PvP 2pc)? Like all of the other PvE set bonuses in the game, the intent behind the 4-piece Scoundrel/Operative PvE set bonus is to provide a small boost to sustained damage. It could very well be the case that the sustained damage gained by adding five energy to the Scoundrel’s/Operative’s resource pool is too small. We will look into this further, and we may at some point make a change to this particular set bonus if we find that we are not completely satisfied with its performance. It is interesting that so many Smugglers/Imperial Agents have taken such a liking to the 2-piece Gunslinger/Sniper PvP set bonus. Due to the DPS gain, it is understandable why this is the case, but the results of this design are unintentional. We touched a little bit on this in the Gunslinger/Sniper questions, and we can go into a bit more depth since you have specifically asked about it. Because of how our ability damage is scored, XS Freighter Flyby/Orbital Strike puts out some of the best DPS in the game – assuming all of its damage ticks hit a target – and this is without the set bonus. While we do intend for XS Freighter Flyby/Orbital Strike to be an excellent choice against three or more enemy targets in an area, the single-target effectiveness of the ability is not intended to be so good, with a possible exception for the Saboteur/Engineering Gunslinger/Sniper. 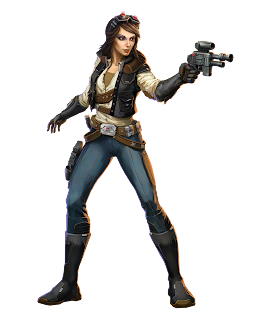 But the other five Smuggler/Imperial Agent specializations are not meant to be using the ability against a single target. To address this issue, we plan to make a few changes. First, we will be lowering the effectiveness of XS Freighter Flyby/Orbital Strike by reducing some combination of its cooldown, activation time, and energy cost. Then we will rescore the damage it does. This will allow it to be used more easily and more often, but it will deal less damage per use. We will also be swapping the 2-piece and 4-piece Gunslinger/Sniper PvP set bonuses, so that the extra tick of XS Freighter Flyby/Orbital Strike damage will be tied to four pieces, and the increased range for Distraction and Quickdraw/Takedown will be tied to two pieces. These changes should combine to bring XS Freighter Flyby/Orbital Strike closer to its intended purpose: being a marvelous multi-target ability and a less than optimal single-target ability. The Q&A was a long and informative read, which I appreciate. Many points were made that left a sour taste in my mouth. These will be touched upon on my next post.